Download "Universal access to early childhood education Overview"
3 1. 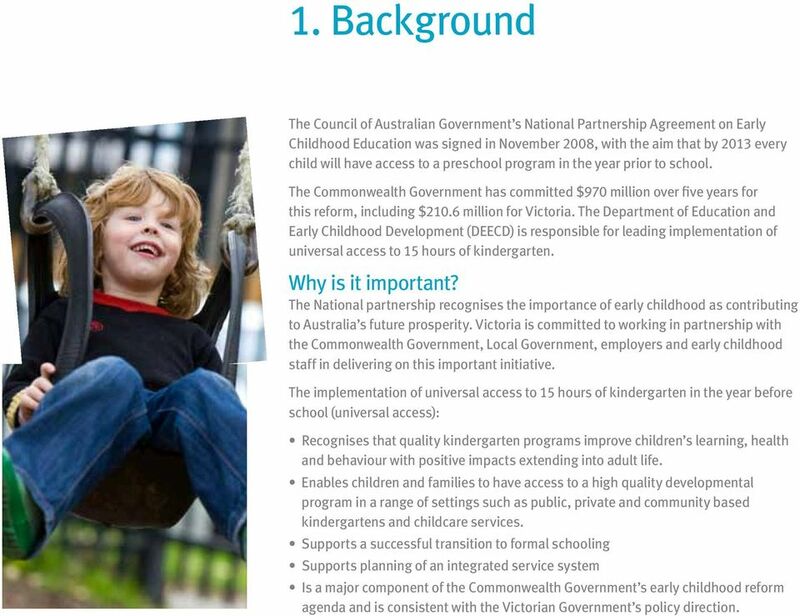 Background The Council of Australian Government s National Partnership Agreement on Early Childhood Education was signed in November 2008, with the aim that by 2013 every child will have access to a preschool program in the year prior to school. The Commonwealth Government has committed $970 million over five years for this reform, including $210.6 million for Victoria. The Department of Education and Early Childhood Development (DEECD) is responsible for leading implementation of universal access to 15 hours of kindergarten. Why is it important? 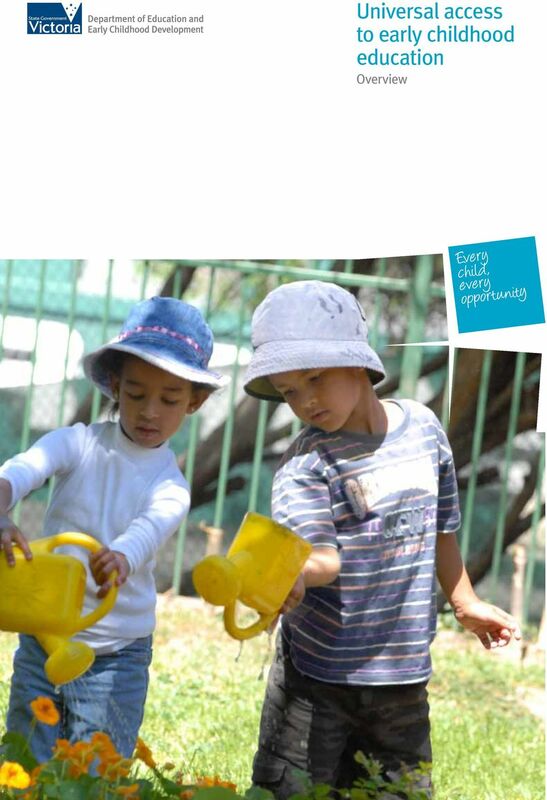 The National partnership recognises the importance of early childhood as contributing to Australia s future prosperity. Victoria is committed to working in partnership with the Commonwealth Government, Local Government, employers and early childhood staff in delivering on this important initiative. The implementation of universal access to 15 hours of kindergarten in the year before school (universal access): Recognises that quality kindergarten programs improve children s learning, health and behaviour with positive impacts extending into adult life. 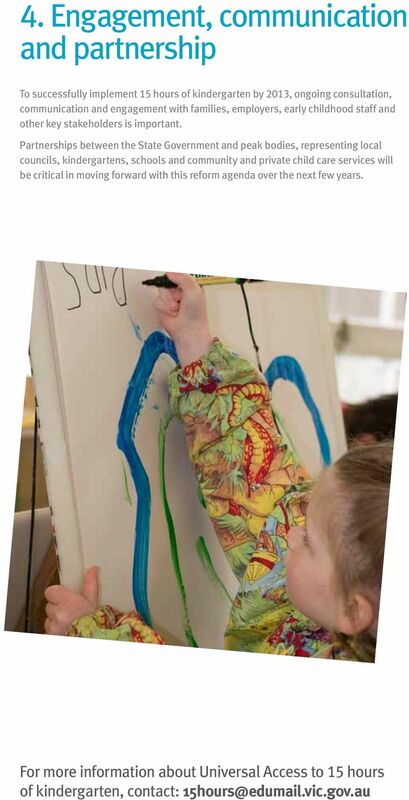 Enables children and families to have access to a high quality developmental program in a range of settings such as public, private and community based kindergartens and childcare services. Supports a successful transition to formal schooling Supports planning of an integrated service system Is a major component of the Commonwealth Government s early childhood reform agenda and is consistent with the Victorian Government s policy direction. Chapter 5 Early childhood sector Although the Committee has focused its inquiry on teachers in Victorian schools, it is aware that there are many teachers in Victoria who do not work in the school sector.